Bailey should have been a reindeer, the way he frolics through the snow like this! I bet if Santa saw this video, he's want him to help pull his sleigh. *Thanks Marci for bringing the unknown reindeer to The Cute! 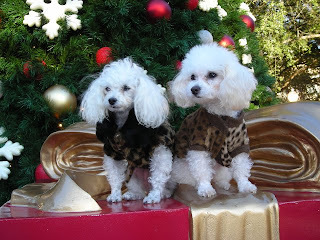 Meet Chichi and Maxie, two princess poodles from Tampa, Fla. These two supermodels are decked out in their Christmas best -- the latest in faux fur fabulousness. This is their Christmas portrait, taken atop of two giant gift boxes in Hyde Park. I'm sure Santa will bring these tiny pooches lots of yummy treats and fun toys! Want your precious pet to be our next Cute Pet Spotlight? Email me pictures and a little bit about them and they can be on Your Daily Cute, too! This is my friends Carolina and Ryan's little cutie, Kai... and this is his first time eating bananas. It looks like he can't really decide whether he likes them -- so many cute faces! They sent me the video a while ago, but it just occurred to me that of course he should be on the cute blog!